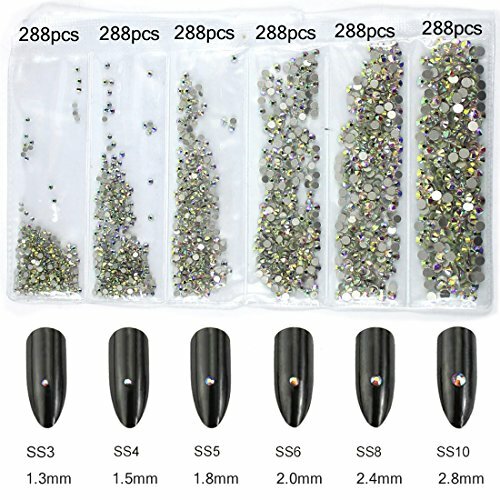 Specification: Material: Rivet/Alloy Quantity: 6 boxes(Approx. 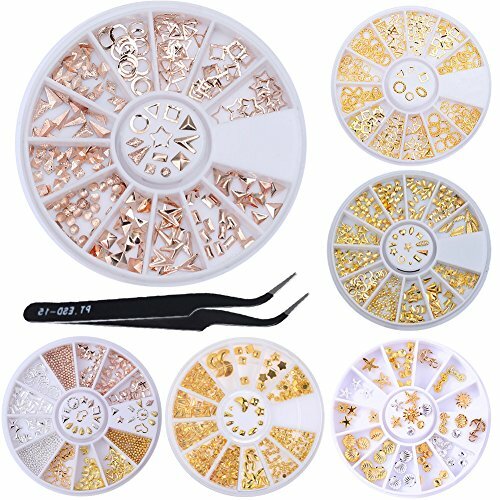 70pcs/240pcs/300pcs/820pcs/210pcs) + 1Pc Rhinestone Eyelash Nippers Tweezers Curved Nail Tool Color: Gold/Silver/Rose Gold Box Diameter: Approx. 6cm Tweezers weight:Approx.19g Tweezers Material: tool steel Tweezers Length: Approx.11.7cm Package Contents: 6 boxes 3D Nail Decoration 1 Pc Rhinestone Eyelash Nippers Tweezers Curved Nail Tool Feature: 100% brand new and high quality Nail decoration Easy to apply on natural or artificial nails. Clean the surface of your nails, brush the base polish, and place it onto nails. Seal with a clear topcoat. You can also use them to decorate your home, cell phone's case, glasses, made card, body art, etc. 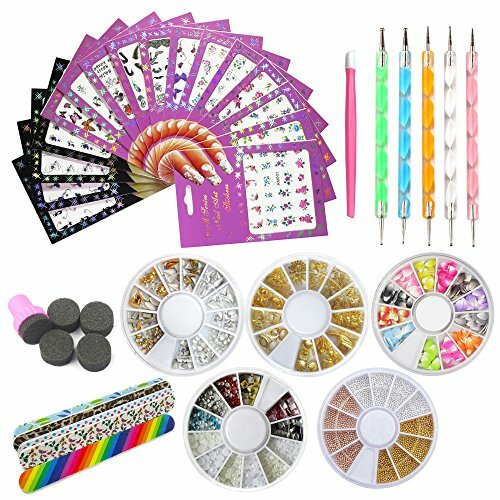 Let your imagination and creativity run wild with all the infinite nail-decoration possibilities this great kit will open up for you! A selection of 30 different rolls of striping tape. Stripe effects are among the most popular forms of contemporary nail decoration. With all the colors and patterns of tape in this set, you'll never run out of new designs and combinations to try out. 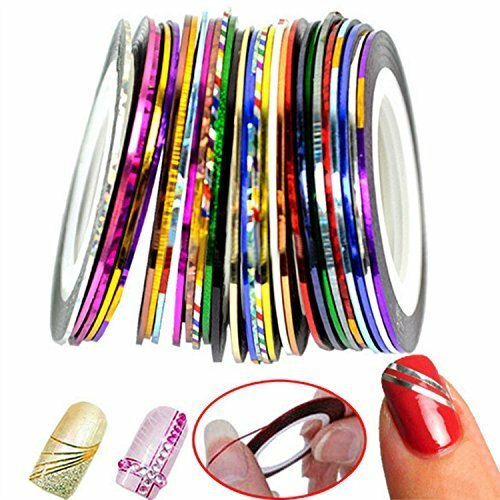 There are plenty of tutorial videos and articles on the web to get you started with using striping tape for nail decoration. Super Easy to Apply Usage: 1. Self-adhesive, no glue is needed, clean and convenience for use. 2. Can be used to design your own nail art,nail patterns, highlight etc. 3. Can be used with UV Gel, Acrylic nail art, nail polish etc. 4. Suitable for professional use or home use. How to use: 1. Clean the surface where the design is to be placed. 2. Select a design and peel off by your nail. 3. Place the design in nail / tip and rub it gently several times. 4. Apply top-coat for best result. 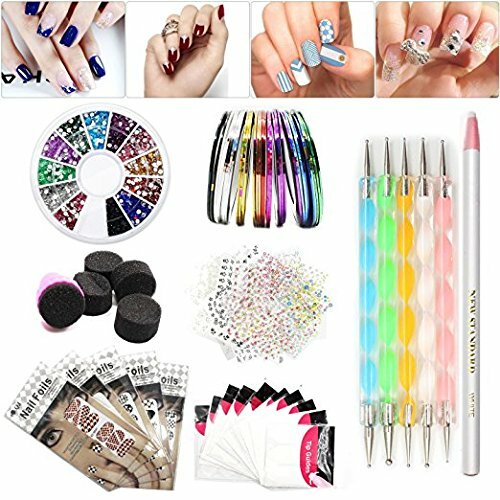 TOP QUALITY NAIL ART SUPPLIES GUARANTEED! Color: Crystals AB. Shiny appearance: These multi-faceted crystals are made of glass with bright and shiny surface, present a charming appearance, bring more inspiration and beauty to your arts and crafts. Mixed sizes: There are 6 different sizes in the delivery for satisfying your different needs, enough for your daily spare and replacement. 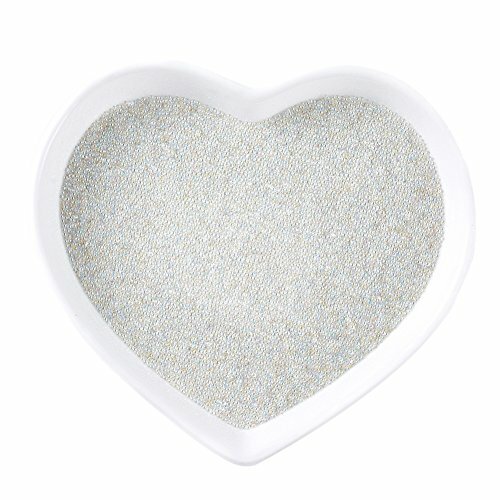 Wide application: these flat back crystals can serve as beautiful ornaments for shoes, wedding dress, books, guitar, tablets, car plates; They are also suitable for decorating your phone, making nail art and card crafting, etc.. Specifications: Diameter: 1.3 mm, 1.5 mm, 1.8 mm, 2.0 mm, 2.4 mm, 2.8 mm Quantity (approx. ): 1728 pieces Notice: 1. Small objects, adult supervision required. 2. These small crystals are different from those hot fix glass stones and they are not self-adhesive, so you need to apply glue to stick them (glue is not included). Super Easy to ApplyConvenient to apply nail art at home but high quality like salon. With Nail Art Club nail wraps, you can have gorgeous, fashion-inspired nails for a fraction of the cost. Plus, there's no dry time, drive time or wait time. Just peel, press, file and go.No more smears and smudges trying to paint your right hand with your left hand. You'll be amazed at the compliments you get on your nails.Long LastingYou can try various other combinations, match with your mood or outfit. Just make sure that the colors are contrasting, so that it can bring the best out of your striping tape ! Self-adhesive, no glue needed. Place it on nails or tips and cut off excess length . Apply top coat for the best result. Great for designing your own nail art and nail patternsRecommend: It's better to apply with top coat or glue to make the sticker keep long lasting! Our nail wraps function just like nail polish because they're made of real nail polish ink, but without the dangerous chemicals that are found in some nail lacquers. 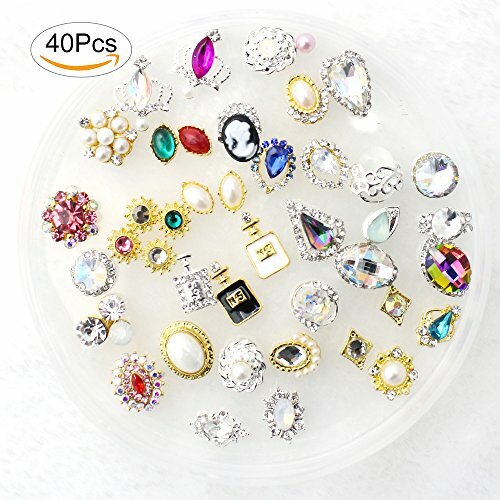 They are non-toxic and 5-Free, which means they don't have formaldehyde, dibutyl phthalate, toluene, camphor or formaldehyde resin.GREAT VALUE AND PROFESSIONAL MANICURE NAIL ART RHINESTONES DECORATIONS SET.TOP QUALITY NAIL ART SUPPLIES GUARANTEED! Product description Every Fashionable And Beautiful Woman Must Have Our Blingbling Crystal Diamond Rhinestone Specification: Quantity: 40 PCS/Set Nail Rhinestones. Rhinestone Size: approx. 11mm x 3mm. Function: DIY nail art decorations. Easy to apply on natural or artificial nails. You can also use them to decorate your home, cell phone's case, glasses, etc. 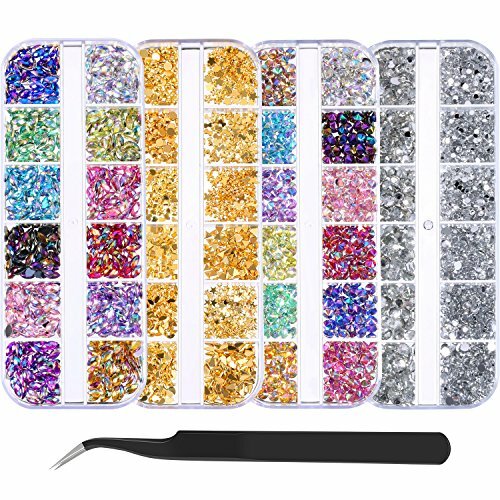 How to use: 1.Clean the surface of your nails, 2.Brush the base polish, 3.Place the nail art rhinestones onto nails, cell phone's case, glasses, etc. 4.Seal with a clear top coat. Colored Shiny Rhinestone, Make You More Elegant And Charming. Add To Cart Now! Specification: 1. 100% Brand New 2. Material: Rhinestones 3. Colors: As picture shown 4. Wheel size: Diameter 6.5cm 5. Rhinestones : Diameter 1.5mm 6. 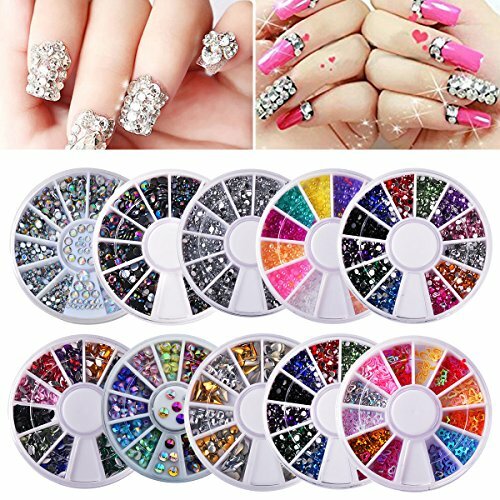 Type: Nail Care Package: 10 Wheels * Nail Tips Rhinestones Note:Due to the different camera model,light and display, Image color may be different with the actual look. If you mind, please don't buy. Thanks!!! Looking for more Decoration Nail Art Decoration similar ideas? Try to explore these searches: Spec Carbon Fiber, Report Shoes Boots, and Plug Speaker Cable. Floristic Nail Art Decoration - How To Create Beautiful Nail Decoration Designs?